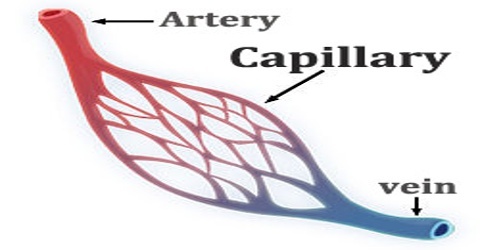 Capillary is any of the tiny blood vessels that connect the smallest arteries (arterioles) to the smallest veins (venules). Capillaries form a network throughout the body for the exchange of oxygen, metabolic waste products, and carbon dioxide between blood and tissue cells. The capillaries are thus a central component in the circulatory system, essentially between the arteries and the veins. Capillaries are found in every square inch of the body, from the skin to the deepest tissues in the body’s cavities. There are between 60,000 to 100,000 miles of blood vessels stretching throughout the human body, depending on the size and weight of the person, and most of these are capillaries. Capillaries are most abundant in tissues and organs that are metabolically active. 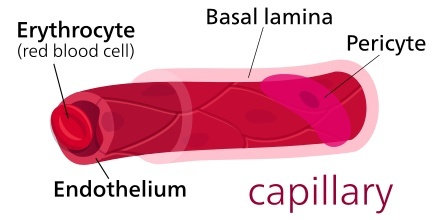 For example, muscle tissues and the kidneys have a greater amount of capillary networks than do connective tissues. These microvessels, measuring around 5 to 10 micrometres (µm) in diameter, connect arterioles and venules, and they help to enable the exchange of water, oxygen, carbon dioxide, and many other nutrients and waste substances between the blood and the tissues surrounding them. Lymph capillaries connect with larger lymph vessels to drain lymph collected in the microcirculation. Capillaries are so small that red blood cells can only travel through them in single file. Capillaries measure in size from about 5-10 microns in diameter. Capillary walls are thin and are composed of endothelium, which is a type of simple squamous epithelial tissue. Oxygen, carbon dioxide, nutrients, and wastes are exchanged through the thin walls of the capillaries. 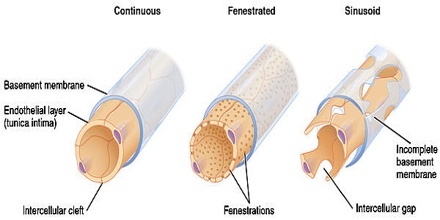 Fenestrated: Fenestrated capillaries have pores in the endothelial cells (60-80 nm in diameter) that are spanned by a diaphragm of radially oriented fibrils and allow small molecules and limited amounts of protein to diffuse. Continuous: Continuous capillaries are continuous in the sense that the endothelial cells provide an uninterrupted lining, and they only allow smaller molecules, such as water and ions to pass through their intercellular clefts. However lipid-soluble molecules can passively diffuse through the endothelial cell membranes along concentration gradients. Discontinuous: Discontinuous capillaries are a special type of open-pore capillary that have larger openings (30-40 µm in diameter) in the endothelium. These capillaries lack pinocytotic vesicles, and therefore utilize gaps present in cell junctions to permit transfer between endothelial cells, and hence across the membrane. Specific types of capillaries are determined by their functions, which affects their number and placement in the body. Capillaries are the smallest types of blood vessels in the body and operate as a network of many blood vessels woven together. They are most numerous in areas of the body that require a higher amount of oxygen and nutrient exchange. Capillaries deliver nutrients and oxygen to tissues and remove the byproducts of cellular reactions, such as carbon dioxide and water. 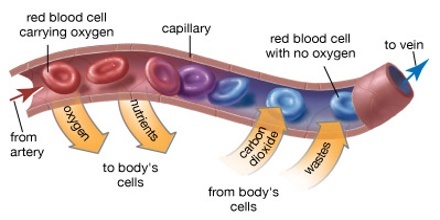 With the exception of the lungs, where the opposite is true, capillaries bring oxygenated blood, blood carrying oxygen, to organs and carry away deoxygenated blood, blood with the oxygen removed. Their walls are very thin to allow substances to easily and quickly diffuse, or pass through them. Capillaries are much thinner than arteries and veins, because their walls are made up of only a single layer of endothelial cells, the flat cells that line all blood vessels. Reference: thoughtco.com, study.com, dictionary.com, wikipedia.